I’m currently again at my parents house. It’s so lovely here. All the greens and whites and lilacs and blues… I like the May. Also because of it’s public holidays. The best month in the year. Except for March. Because there’s my birthday and you should know by now how much I love my birthday. Best day ever. But when it comes to month. May is my favourite. My parents have a huge garden – one for flowers and one for growing vegetables. When I’m here and the sun is out I just love to sit there and work on something. It’s so nice to work outside instead of indoor all the time… Maybe one day I call a little garden (or even a balcony at least) my own. But that’s not what I wanted this post to be about. Sorry. I lost my focus.This will be about another 2-post-project like I told you on Twitter. Like the Superdatti and its cover. So this post is important for the post next week but also a project on its own. Sounds complicated? It’s not. I promise. Today we will learn how to make a chevron friendship bracelet. 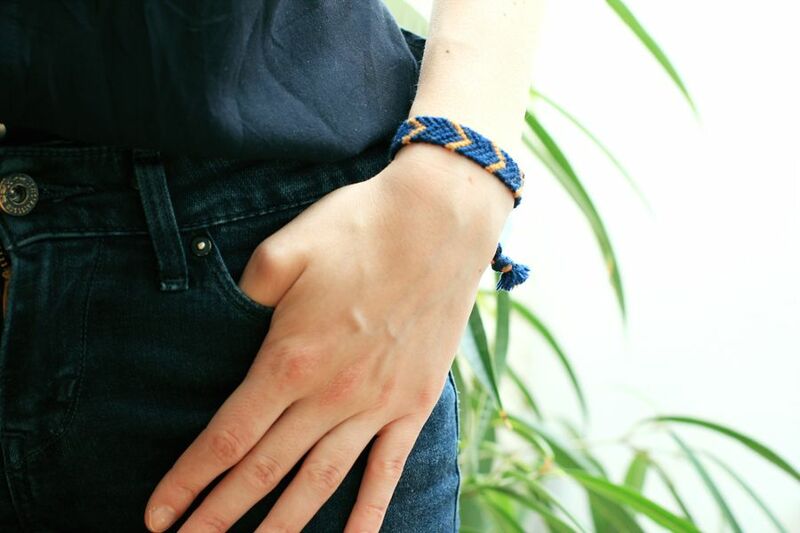 If you’ve never knoted a friendship bracelet, this post is for you. If you have, this might inspire you to give one to your friends again. I did that back in the days when there was no facebook and I actually had real friends. And to keep them I handed out friendship bracelets. 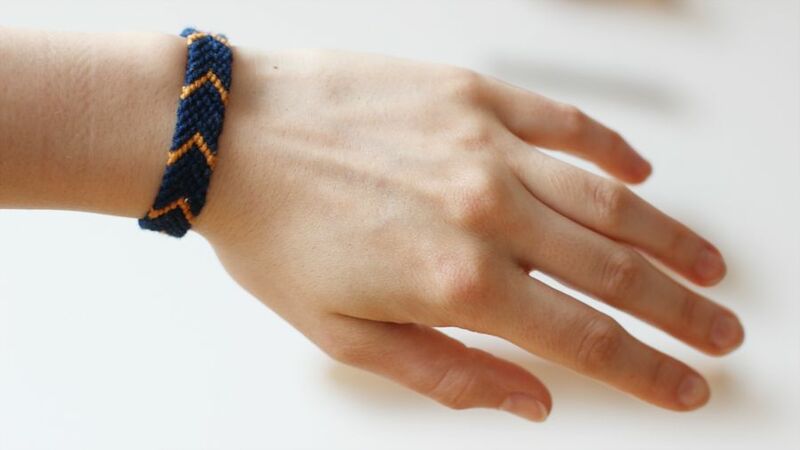 When you put them on for the first time, the person getting the bracelet could make a wish and once the bracelet fell off, the wish comes true. Or so the legend. First of all you need yarn. I show you how to make the pattern with 5 different colours. This makes it easier to understand but I used only 2 colours for the bracelet. However if you are a beginner, try with these 5 colours. It’s easier. So you need 2 strings of each colour about 80 cms long. You should have 10 strings in total. Make a knot in the whole bunch about 7 cms from one end. Then stick it with some washi tape to the table. Organize the colours in the following pattern: on both sides it goes from the outside to the inside and in the middle one colour meets. Now we start knotting. Put one part with all the 5 colours aside. You’ll need them later. Take the first (red) and second (dark blue) colour and put the 2. colour (dark blue) over your index finger and the first colour (red) under your index finger. Put the red string over your index finger and pull it through. 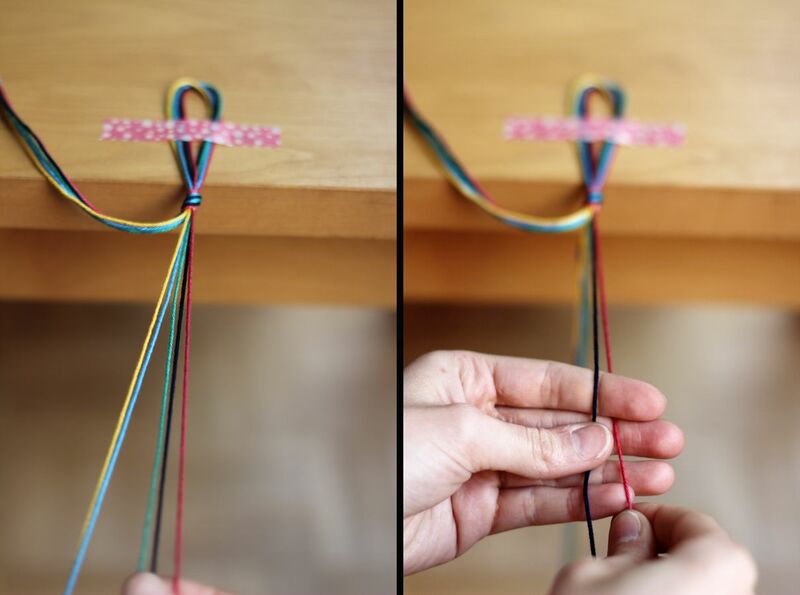 Let the strings slip from your finger and you should have a loop of the first colour (red) around dark blue string. Pull both strings until the knot is tight. 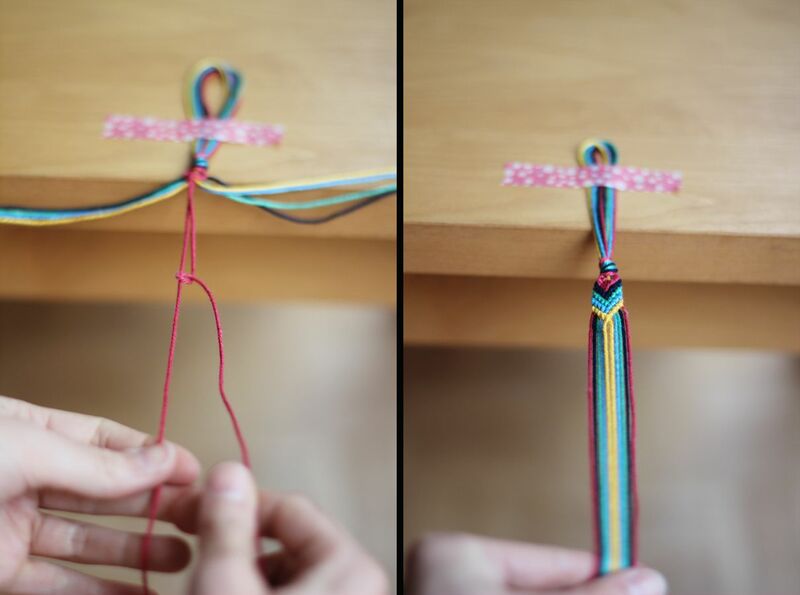 Follow this 2 steps to make another knot with the same strings. Then take the third colour (green) and make a knot with the first colour (red) again. 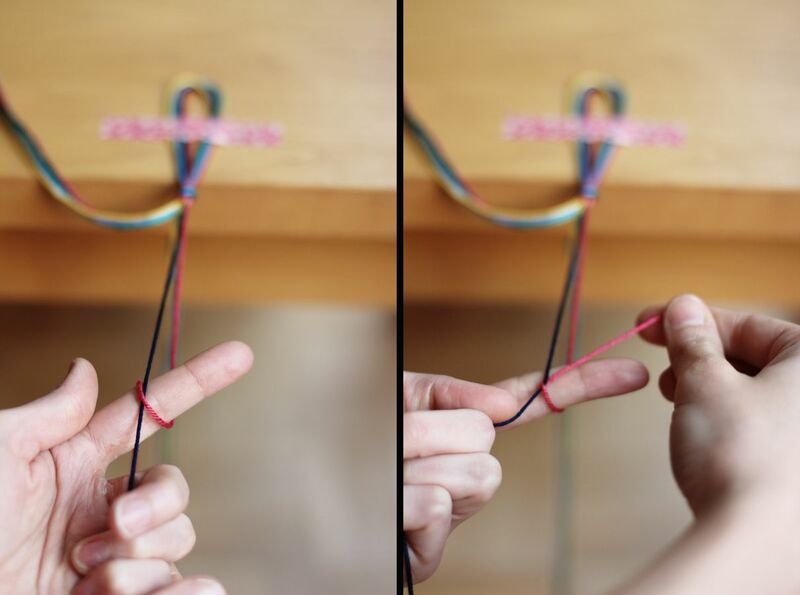 The red coloured string in these pictures moves from the outside in making 2 knots around every coloured string. Once you made this side you do the same with the other side – moving with the first colour (still red) from the outside in and making 2 knots with ever string. In the middle both red coloured strings meet again. 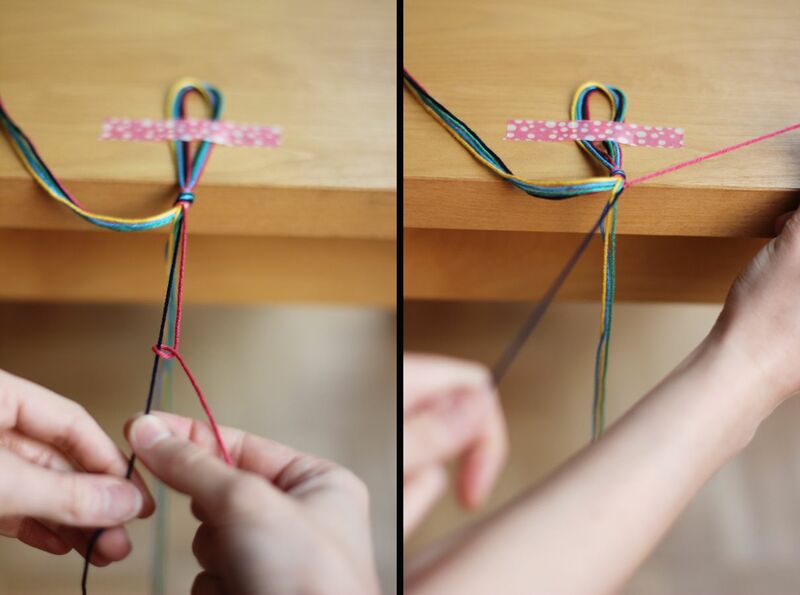 Make another 2 knots with the same coloured strings. Voilá. 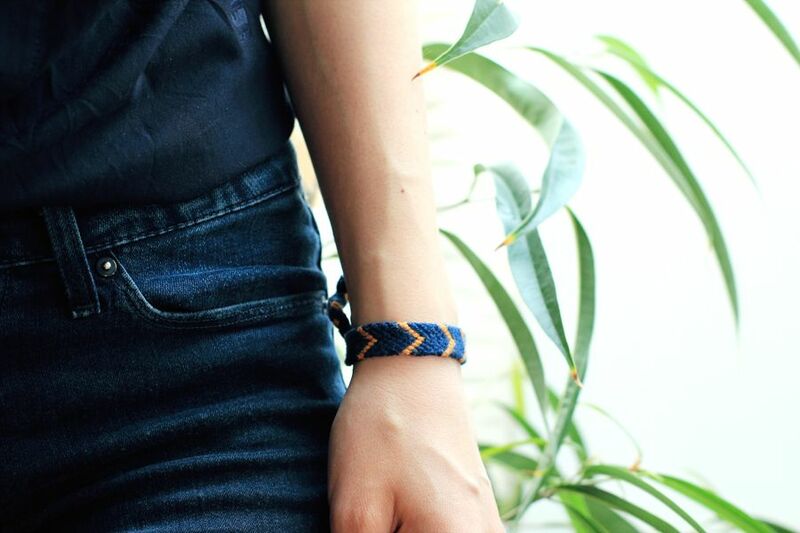 You made the first chevron. You might not be able to see it but trust me you are on the right way. Just follow with every colour that’s now on the outside and do the same. 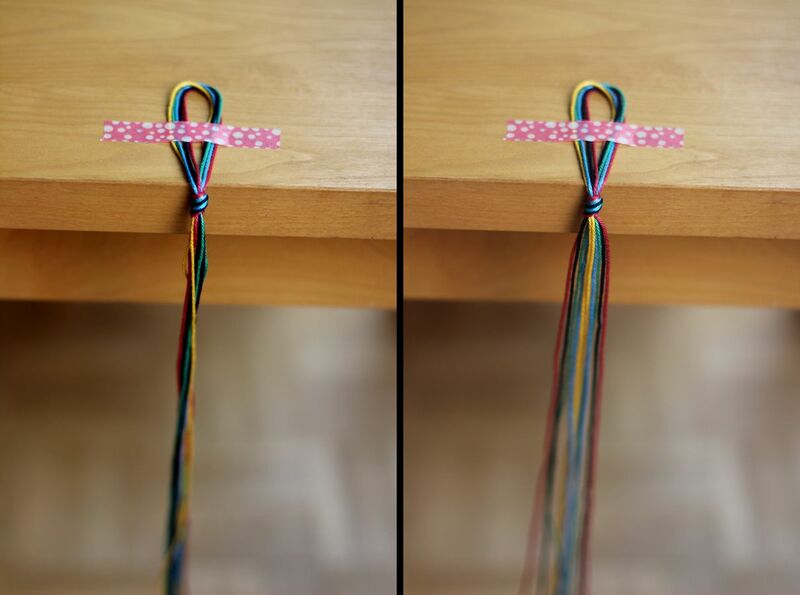 On the right side you see how it looks like when you knotted all colours once. Then start with the red again until the bracelet is as long as the scope of your (or your friend’s) wrist. As I told you before: for me I made one with not 5 colours but 2. I used, however, still 10 strings in total – 8 strings in dark blue and 2 in gold. Who would you give it to? 12 DIYs to try for a crafty Valentine’s Day. 5 tips on how to write tutorials that are easy to follow. 7 DIYs to get ready for Easter. Indian summer. | Look what I made! Christmas presents for the hard-to-present. | Look what I made! Top 10 of 2013: DIY | Look what I made!